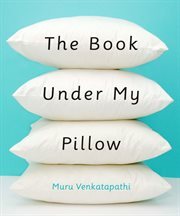 The item The book under my pillow, Murugesan Venkatapathi represents a specific, individual, material embodiment of a distinct intellectual or artistic creation found in Evansville Vanderburgh Public Library. The best things come in small packages... self-help, motivation, philosophy, social commentary and humor, are all rolled into this little book of quotes and snippets. Ideal for the office shelf, bedtime reading or stress-busting short breaks, this handy, easy-to-carry volume, does not have any one lesson to share, but many, which one can come back to again and again whenever one wishes to. It is not a one-time read but an enjoyable multiple reading venture with assorted quotes from some well-known and some not-so-well-known people, in addition to the author's insightful and sometimes irreverent, snippets. Some of the quotes hit hard and compel us to put on our thinking caps, while others are light and funny, but always eye-opening. Some can be put up on our screens to motivate ourselves while others just may not resonate with a person right away, but nevertheless make one reflect. This is truly The Book Under My Pillow..